My traveling companion and I took our first Louisiana swamp tour. 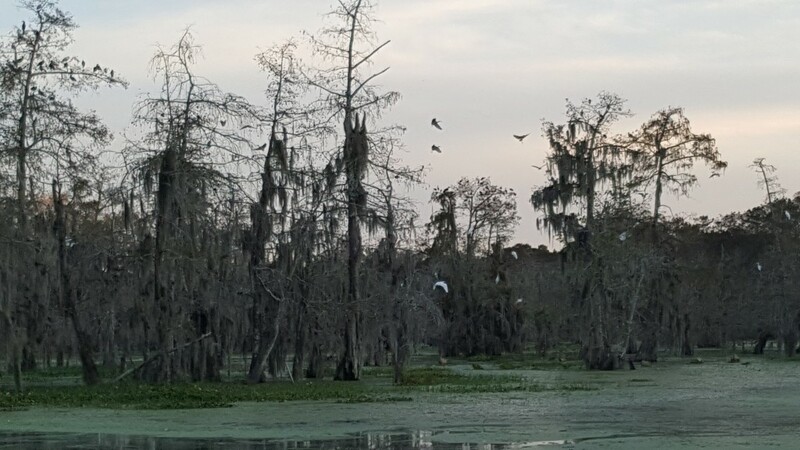 You expect to see alligators on your first Louisiana swamp tour, and we did. 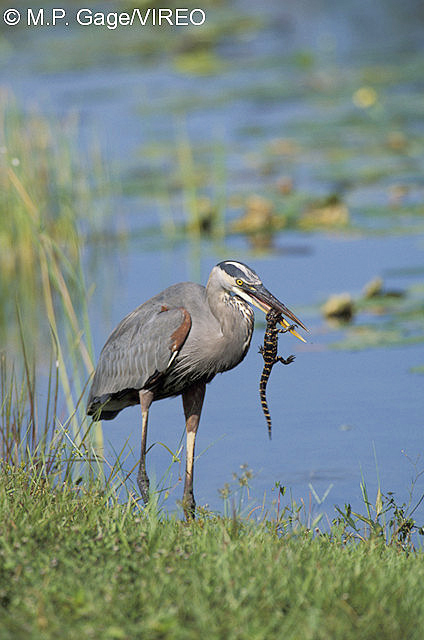 You don’t expect the gators to be upstaged by birds. Our gators were upstaged. Easily. 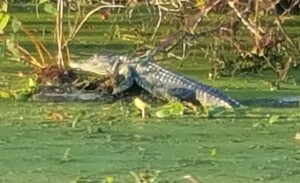 This gator posed for us a while. This isn’t to express disappointment in our gator sightings. One posed for a few minutes on a log. We saw some noses and eyes in the water that were barely distinguishable from floating logs (though one of those “logs” was definitely swimming away from us). 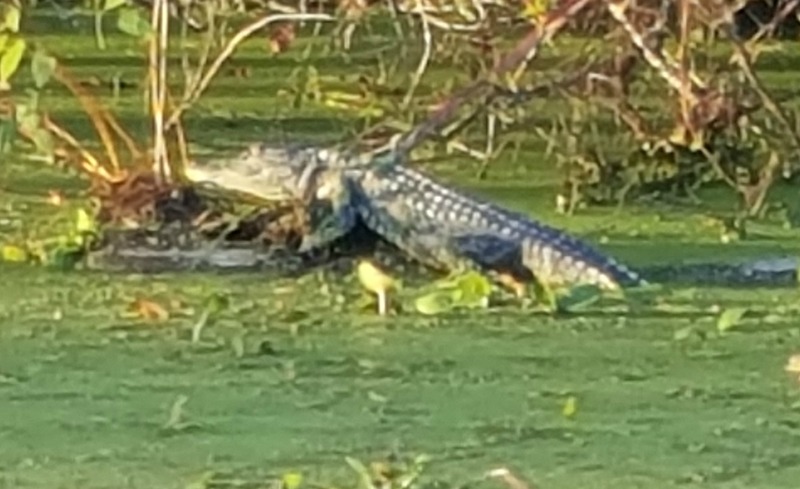 We didn’t see an alligator up close, but that would have been a mixed experience at best. 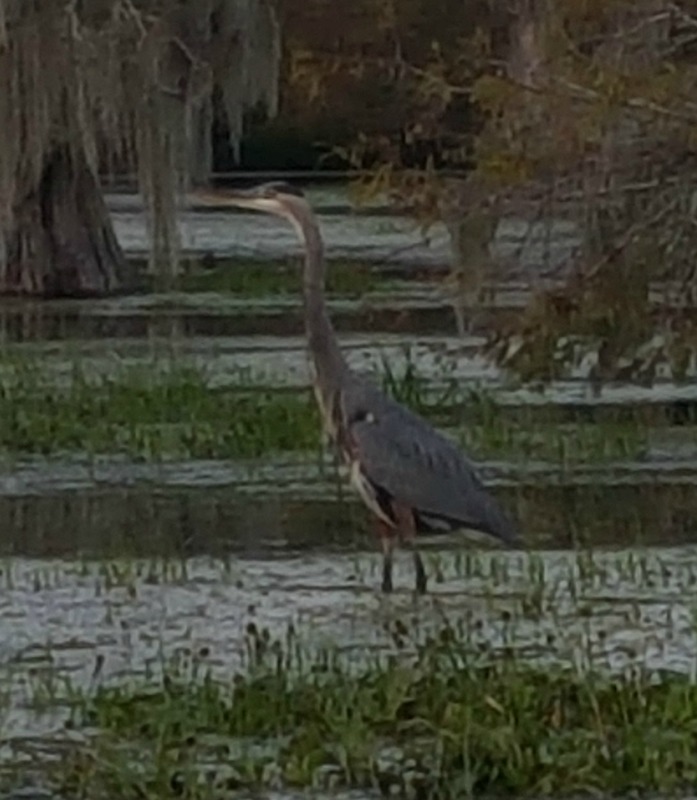 The gators didn’t disappoint, but the birds delighted: Great white egrets, great blue herons, phoebes, kingfishers (hey, it’s Louisiana), ibises, cormorants, great cormorants, cardinals, red-winged blackbirds. And owls. More on the owls and other birds shortly, but first some context: My traveling companion and I haven’t traveled much this year. My treatment for lymphoma (and for other ailments resulting from chemotherapy) has kept us in Baton Rouge for most of 2015. We made two day trips to St. Francisville, and our son’s wedding in Maryland came in a break in treatment while I was safe to travel. But mostly we’ve stayed in Baton Rouge, spending several weeks in hospitals and otherwise working or resting (and limiting my exposure to infections). I’m scheduled for a stem-cell transplant starting Dec. 1, and that will mean a few more weeks in the hospital. But I’m feeling fine now, so we decided on an overnight trip to Acadiana. 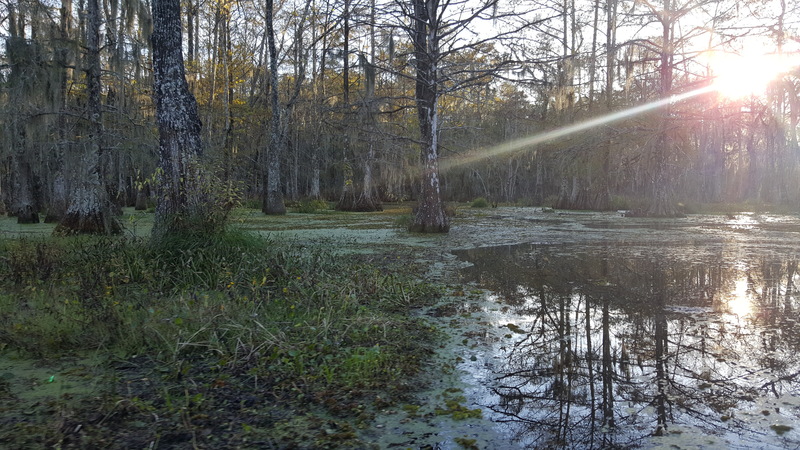 We’ve lived in Louisiana more than a year now, and it was time for us to visit a swamp. And it was a beautiful weekend for spending some time on the water. By mid-morning Saturday, we were headed west to see and taste Cajun country. Shawn Guchereau, our swamp tour guide, explains there are hundreds of tiny plants in the green goo on his fingers. This was such a Louisiana weekend that we enjoyed double doses of both beigneits (at Old Castillo Bed and Breakfast, where we stayed in St. Martinville, and at Joie de Vivre café in Breaux Bridge) and boudin sausage (boudin sliders on delightful biscuits at Joie de Vivre and straight boudin M & S Grocery in Lafayette). 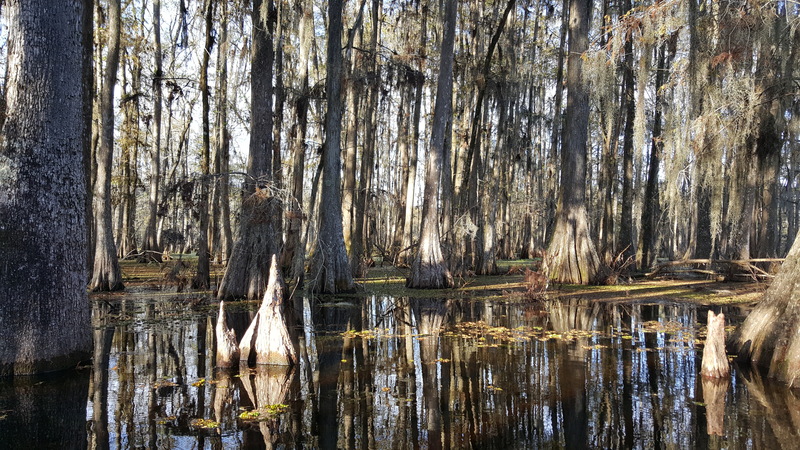 But the absolute highlight of the weekend was drifting through the Lake Martin swamp in a boat piloted by Shawn Guchereau of Cajun Country Swamp Tours. A third-generation guide in this swamp, Shawn explained the history of the lake and the threats from increased development nearby. He loves this water, loves sharing its sights and fears for its future. 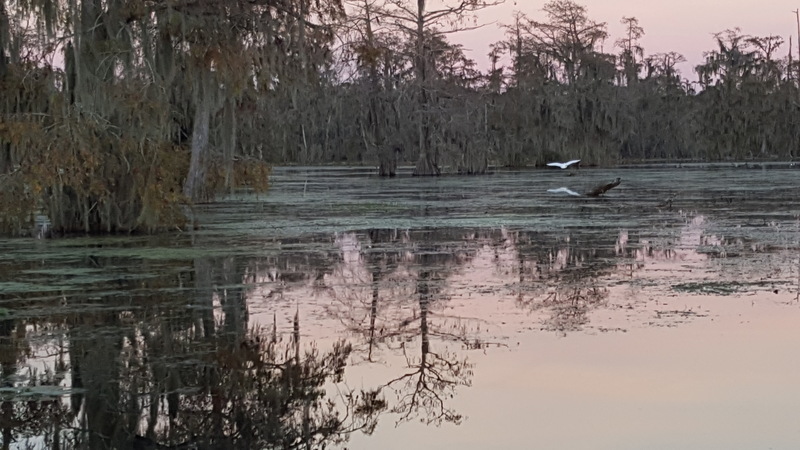 As we floated through the swamp and lake, Shawn’s love for all the life in and on the water came through in his explanations of each of the different types of plants floating on the surface. He told us the names of the flowers and the invasive species and showed us how some little leaves (I can’t recall their name, but he told us) stay afloat with tiny “life jackets,” air pockets on the undersides of the leaves. He explained about the cypress trees standing in the water and about the lichen growing on some of the trees. 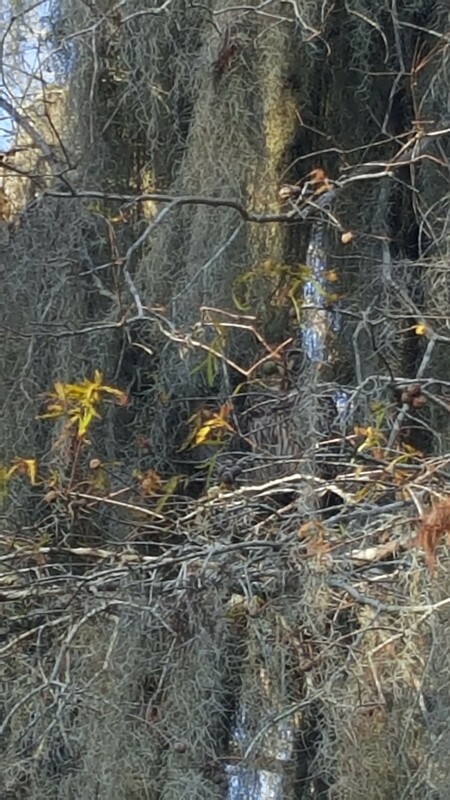 Can you spot the owl here? I’ll point it out in a photo at the end of this post. And he knew where to watch for the owls. Somewhere high in one of the trees was a huge owl that he pointed out to us early in the tour. We could see its silhouette, but no detail. After just a minute or two of our surveillance, the owl spread its mighty wings and flew away too swiftly for me to snap a picture. I shot dozens of frames of the next owl, which tolerated our presence for several minutes. 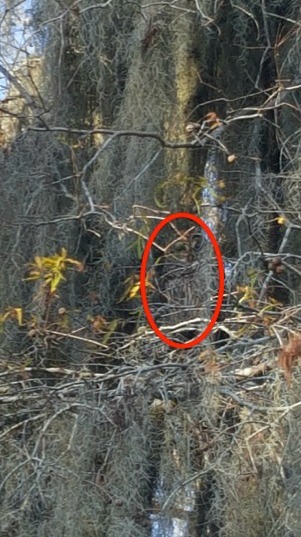 We could see the owl clearly once Shawn pointed it out to us, but he almost blended in with the branches and Spanish moss in the tree. 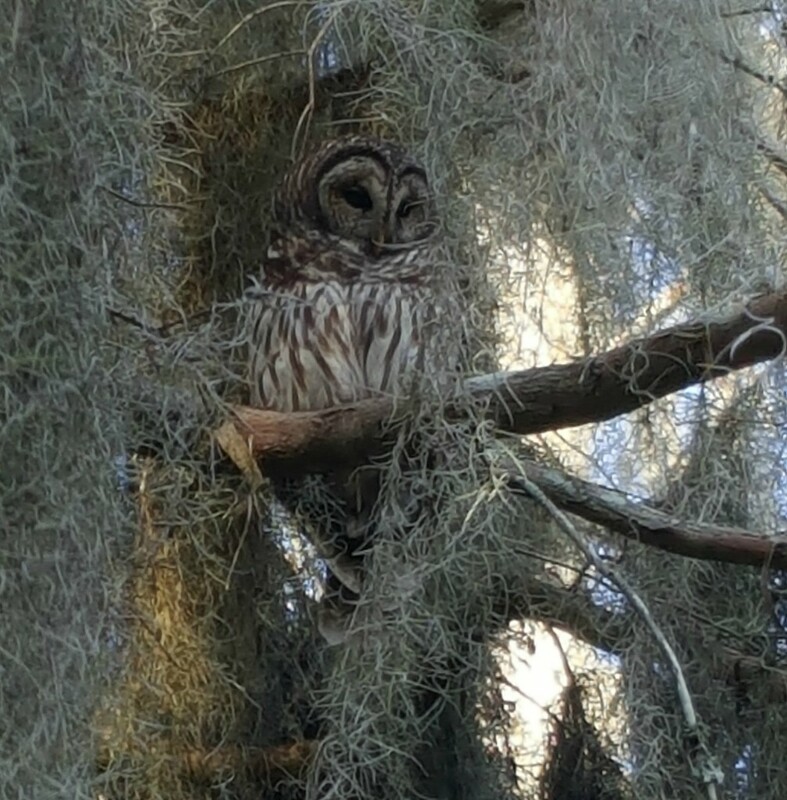 Shawn sees the owl often enough to have named him – Harry Potter. For the first few minutes we watched the owl, he was barely identifiable in my photos, though clearly visible to the naked eye. Shawn, knowing we’d get better photos, gently steered our boat under the tree for a better angle (resulting in the shot below). Shawn positioned our boat perfectly for photos of Harry Potter. 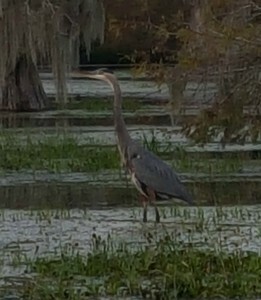 A great blue heron posed for us a while but didn’t eat an alligator. The tour gave us fleeting views of phoebes and blackbirds as they zipped past us, and frequent serenades from birds in nearby trees. Individual egrets and herons attracted our attention, as well as flocks of cormorants. We paused for a while to watch a heron that ignored us completely. 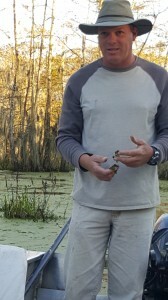 Perhaps we looked skeptical (and perhaps most tour groups look the same way) when Shawn told us that herons can eat small alligators. He passed around a rolled-up photograph as proof, and I later found a few more through Google image searches (best one is below). Shawn showed us nests of various birds, explaining the “pecking order” and which birds nested high in the trees and which chose lower spots. What we didn’t see were ducks. We saw duck blinds and flocks of floating decoys, but we came to Lake Martin at the wrong time for non-wooden ducks. Watching the birds roost for the night was a treat. More roosting photos at the end of this post. 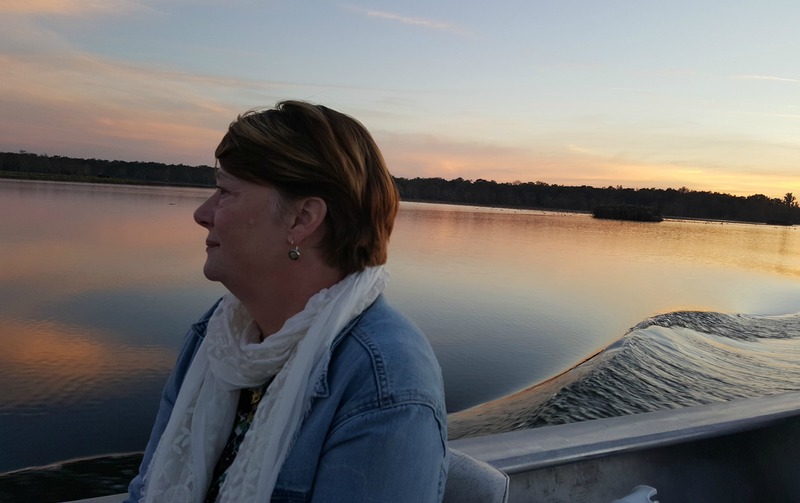 Shawn called our cruise, which began at 3:15 p.m., the sunset tour, and the sun was dropping toward the horizon throughout, providing shimmering reflections across Lake Martin. The fading sun also told the birds it was time to roost for the night, and Shawn steered us toward a favored roosting area. 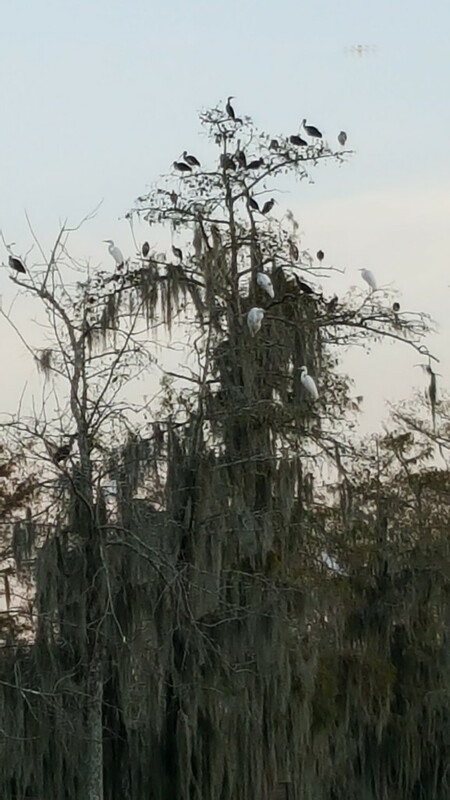 While our owl observation was a close-up view of a single magnificent bird, roosting was a time to watch hundreds of magnificent birds roosting in equally magnificent trees. Pardon the repetition, but it was a magnificent sight and sound. Flock after flock of ibises and egrets and cormorants found branches for the night, the flapping of their wings and their calling to each other filling the air with wondrous noise. We watched the roosting at two groves of trees. Each new flock arriving caused a stirring of wings from the birds that had already claimed their perches. The sun was almost gone as we returned to the shore. We’ll be back next year, perhaps with family visitors. 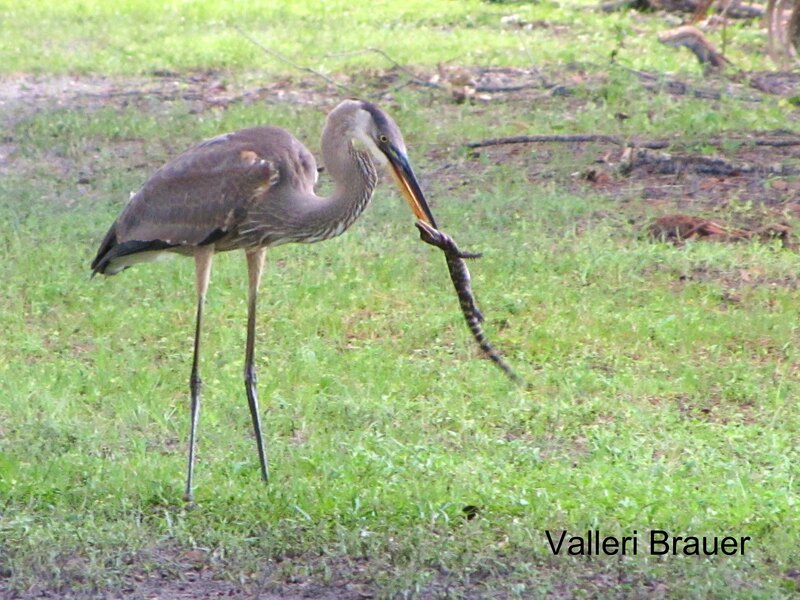 In the meantime, we have lots of memories and photos of birds and trees — and yes, a gator — to lighten the next hospital stay. The only ducks we saw were decoys. 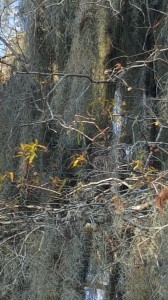 One of the more elaborate duck blinds we saw is at the right in this photo. An egret takes an evening flight across the swamp. 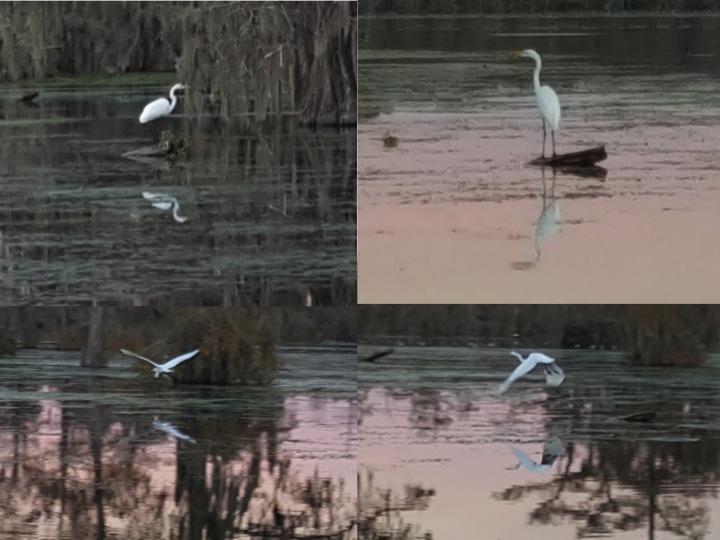 Whether they are standing or flying, I can’t resist shooting photos of egrets in the swamp. 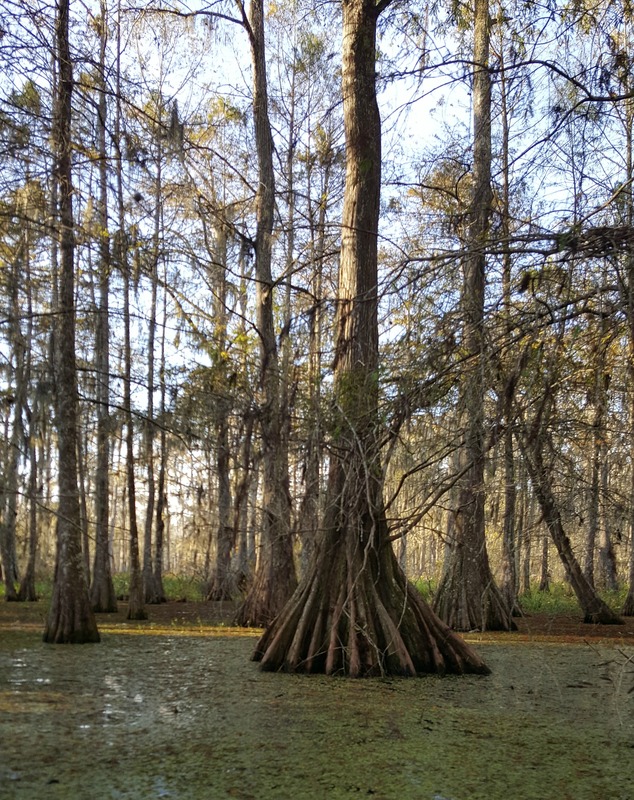 These two trees are Shawn’s favorites in the swamp. He thinks they look like a married couple. 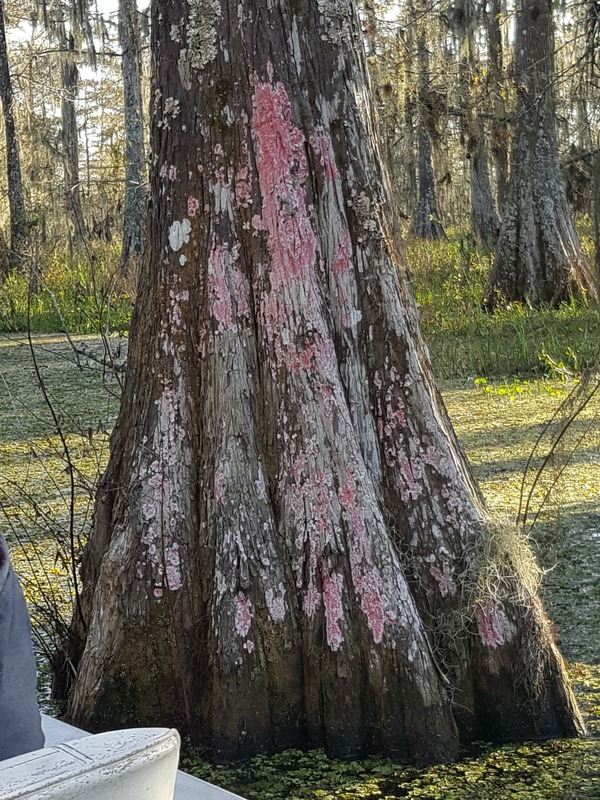 This tree is covered with red lichen. 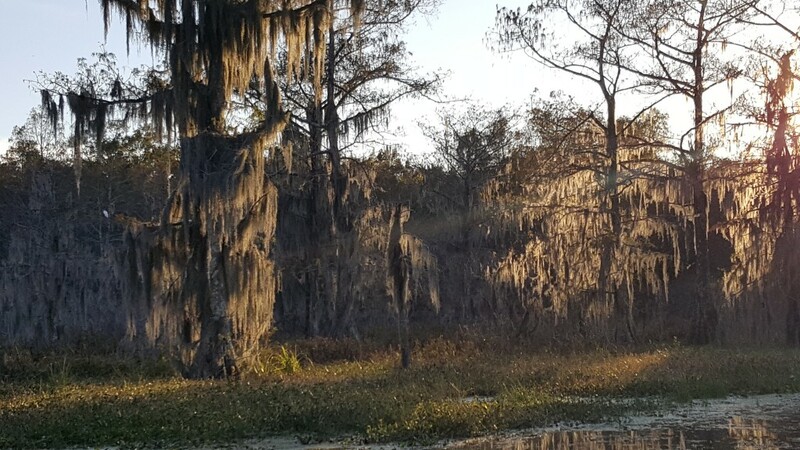 Spanish moss is part of the swamp’s beauty. Some of the trees have massive trunks, especially at the base. 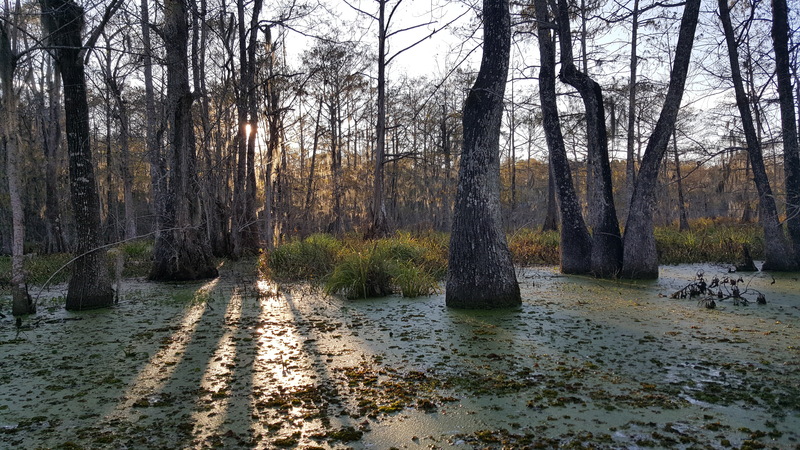 The setting sun gave the swamp beautiful highlights. Roosting birds fill the high branches as well as the low branches of their favored trees. 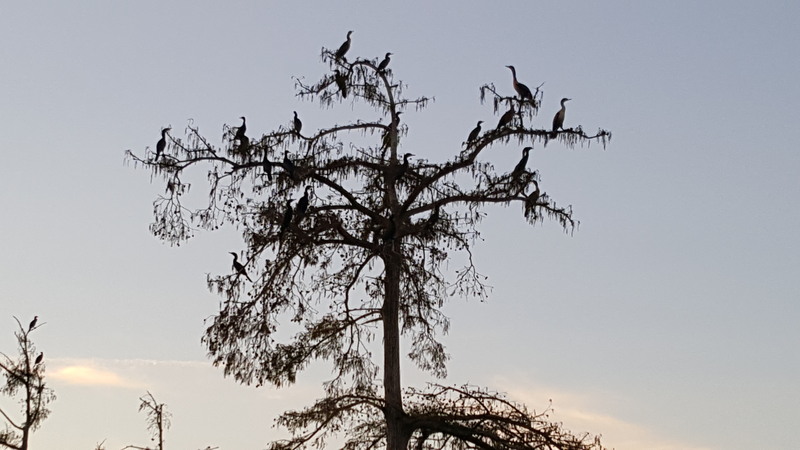 Bedtime for the swamp birds. My traveling companion and I plan to return to the swamp. As for the owl hiding in the photo earlier in the story, he’s inside the red oval here.